Desserts To Be Thankful For! This Thanksgiving, let’s be thankful for all the dreamy desserts that don’t involve Apple or Pumpkin! There are so many incredible flavors of the season, so enjoy these dreamy little desserts and hopefully gain some inspiration for your big Thanksgiving bash! I love this adorable turkey cake featured on Half Baked! This little cake was designed by Dream Day Cakes from Gainsville, Florida! 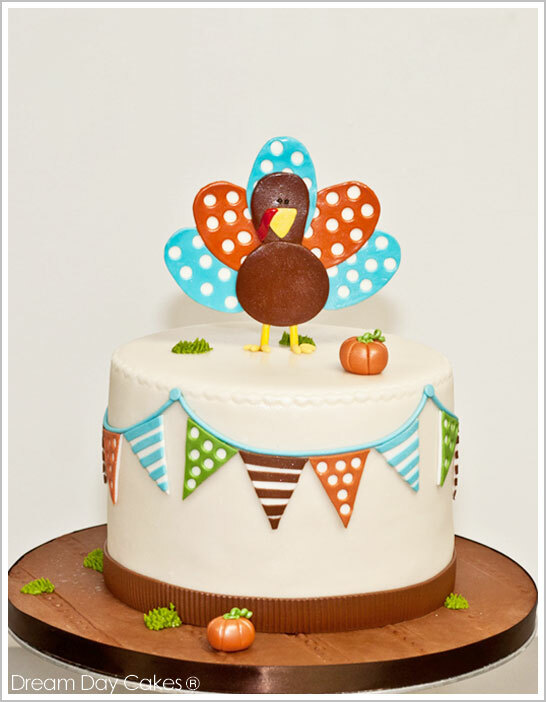 For more “Gobble till you Wobble” fun, check out the printable collection for this totally cute cake by Lauren McKinsey! How about this Sweet Maple Nut Cake from Bakingdom? I’m obsessed with the fall frosting piping job done on this dreamy white cake! How cute is that little owl? Maple is such a warm fall flavor, sure to compliment any bellies on Thanksgiving! If you’re not feeling too adventurous on the dessert front this Thanksgiving, consider dressing up those store-bought cupcakes and treats. Kim Stoegbauer of The TomKat Studio designed an adorable FREE printable collection for your Thanksgiving dinner. What kinds of desserts are you making for your thanksgiving dinner? Tell me about it!